Before you read this post, stop and notice the rumor tag above. Leaked screenshot of benches can almost rarely be verified and this one will be no exception. Chiphell forums is the obvious suspect for leaks of upcoming GPUs, partially because the Taiwanese Supply Chain gets seeded with prototypes early and partially because anonymity is assured and leaks difficult to trace. It has had its fair share of ‘legit’ leaks and also, poor fakes, and now we have one more such rumor awaiting verdict. A screen shot showing what appears to be an AMD Radeon R9 300 GPU benchmarked on 3D Mark 11 has surfaced. I have already made up my mind about this leak which I will tell you at the end. 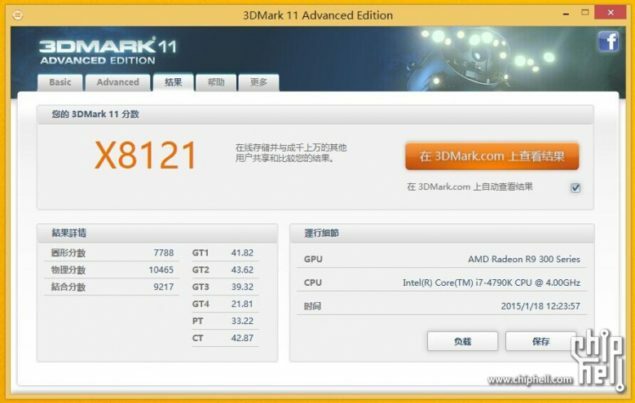 The screenshot appears to be taken from Windows 8 and shows the final 3D Mark 11 result screen. The Score is given with the ‘X’ prefix, indicating that the choice of benchmark was the Xtreme preset. The score is an astounding X8192 points. That is ALOT. That is infact, huge. The CPU chosen was the i7-4790k which boosts upto 4.4Ghz so you can be sure that no amount of CPU-bottleneck was present in this test (not that 3D Mark 11 isn’t already exceptionally good at removing processor bottlenecks when benchmarking GPUs). This version of 3D Mark 11 is mostly indecipherable to me because the language is Chinese but I can see that the “validate online” check box has been ticked which means that a copy of the result should have been available online. However, upon searching through the 3D Mark 11 database, I found no reference of any R9 300 related GPU. There are three possible reasons in this case, 1) the chap’s Internet connection wasn’t working, 2) AMD has had the record pulled on request 3) its a fake. I am personally leaning towards it being a fake primarily for the reason that the score is just absurdly huge, infact this is the score you should get while benchmarking two R9 290s with this processor combo…. to the dot. 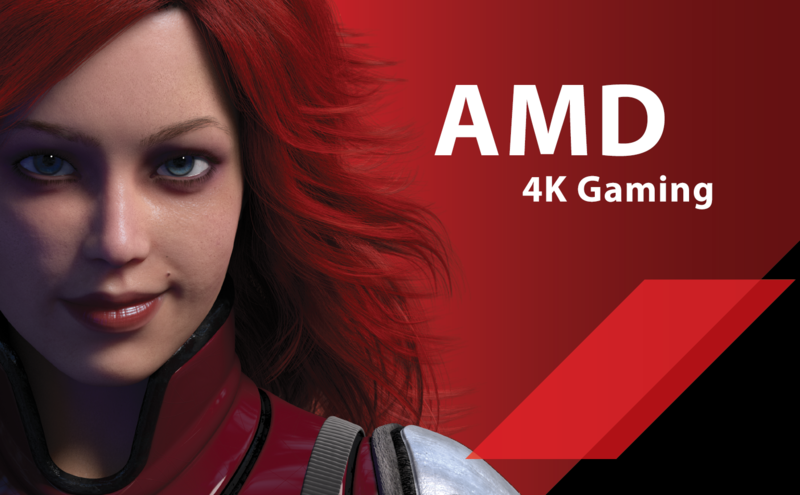 However, the fact that the benchmark reads R9 300 Series as opposed to a certain GPU does lend some credence though not enough to sway my opinion of this probably being a fake. The only reason I am posting this is on the off-chance I am wrong about this. The biggest AMD die has around 4096 SPs and HBM on top, but even with all that I find it kind of hard to imagine AMD pulling off a 100% performance increase over cut-Hawaii. If AMD’s R9 390x can actually score X8192 points in 3d Mark 11 than gamers are going to be super happy in the coming months.